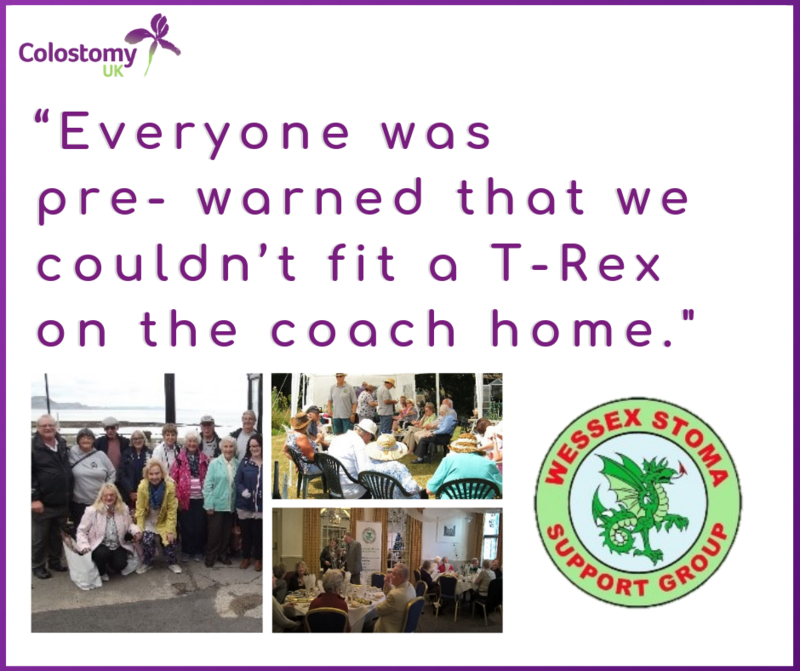 “It is a pleasure to take you through just four of the highlights of a very busy and successful year for the Wessex Stoma Support Group and thanks goes to a terrific Committee who makes these events happen. The Wessex Stoma Support Group held our annual BBQ at Dairy House in Fifield Bavant on Saturday 14th July. The weather was stunning and the food excellent. Everyone had a wonderful time enjoying the spectacular Wiltshire/Dorset scenery and enjoying each other’s company in a relaxed setting. During the BBQ, WSSG Committee member, Mel Rogers, completed a sponsored silence, raising funds for the Group. We know how hard this was whilst our more mischievous members were doing all in their power to get her to talk! Lunch was followed by a raffle. The first prize was a £50 John Lewis gift voucher kindly donated by our supporters, Irwin Mitchell Solicitors. We move on to August for our next event. We were invited by Fittleworth Medical Ltd to visit so on the 10th August, we took a dozen members to their new Head Office in Littlehampton. It had taken a long time to arrange due to holidays and such, which started during the tremendously hot spell, and with this in mind Suzanne Bridger of Fittleworth organised a BBQ lunch for us. Naturally this being england, the weather responded by throwing thunder, lightning and torrential rain at us all day! Nevertheless Fittleworth are terrific at these sort of events and gave us a very special day with a tour of the facility and a really interesting presentation from Stoma Nurse Jacqui about her history that brought her to Fittleworth. After lunch we gathered in the conference room for a demonstration by Marie who cuts 900 flanges a day! Then we had a cutting competition – Boys vs Girls – finishing with a cut off between best girl Isobel and best boy myself and after a very exciting final the competition was won by the boys. I would like to say that I was most impressed with the caterer who despite the weather cooked the BBQ food outside. Although when we got there we all went our separate ways, we ended up meeting up at various points throughout the day and sharing with each other what we had been up to. Finally our Jewel in the Crown for the year was our annual Christmas Meal, held at the White Hart Hotel in Salisbury on 7th December with around 40 members this year we were treated to a festive delight, excellent food, terrific service and everyone in a party mood. The staff at the White Hart were outstanding knowing who sat where and what you had ordered made the afternoon all the more enjoyable, after two hours of filling our faces and laughing it was time to loosen the belts and ties and with Merry Christmases all round head for home.